Roosters are very colorful birds, sporting a combination of red, blue and orange feathers along with a crown atop their head, and a large plume of a tail. Roosters also stand slightly upright. Hens have white feathers and wings, yellow beaks, yellow feet and red wattles. Their texture is somewhat checkered, in a similar fashion to wool. Chicks have yellow feathers and stand at the same angle as their mother regardless of gender. 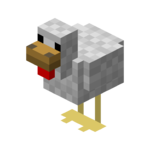 Due to the chicken's small size in comparison to other mobs, they disappear from view at shorter distances, making them harder to search for without turning up the volume, or the assistance of third party map tools. Eggs are one of the slowest decaying raw foods and are produced with minimal player interaction, making them a reliable source of protein. Feathers are required for the crafting of Arrows. The larger the chicken, the more feathers it will drop upon death. Sneak (Default:⇧ Shift) and right click on an adult chicken to remove a single feather. Plucking chickens deals 25 HP of damage, so make sure to let them regenerate between plucking. Depending on the size and gender of the chicken, it will drop 28 to 52 oz of raw poultry upon death. Chickens follow the player if they are holding wheat grain, or can be lassoed with a rope. When a chicken falls from a ledge, it quickly flaps its wings and falls slowly to the ground to prevent fall damage. Roosters will make a loud crowing noise at dawn. Chicks will follow their parents or any nearby chicken until they reach adulthood, a process that takes about 3 in game months. Nest boxes are crafted using planks and straw. Hens will automatically path towards nearby nest boxes and sit in them to lay their eggs. While in a loaded chunk, a hen lays one egg every other day. If there is a rooster nearby, the eggs can become fertilized, and will hatch into chicks after three quarters of a month has passed. If the fertilized eggs are removed from the nest box before they hatch into a chick, they will become unfertilized. 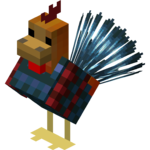 Added TFC Versions of Chickens. All animals now have new growth and mating systems. Chicken drops increased greatly. The bigger the animal, the more drops. Chickens take a full day to lay a new egg. Only female chickens lay eggs. Wolves will actively hunt chickens. Added nest boxes for chickens to lay eggs in. Chickens take two days to lay a new egg. A plop sound plays when chickens lay eggs in the nest box. Chickens can still be bred the vanilla way (no account for gender, instant baby) using pumpkin seeds. Ropes connect above the chicken's head when attached. A hen sitting in a nest box. This page was last modified on 6 November 2014, at 19:57.